Newly Renovated Accommodations at Secrets Maroma Beach! It’s #TravelTuesday and we have some exciting new photos to share with you from Secrets® Maroma Beach Riviera Cancun! We’re offering you an up-close look at some of our newly renovated suites to get you in the tropical spirit for your upcoming vacation! Read on to check out some of our stunning new suites! Enjoy our Preferred Club Honeymoon Suite at Secrets Maroma Beach Riviera Cancun! Plan the Ultimate Group Getaway to Secrets Aura Cozumel! Have you been dreaming of heading to paradise with a group of your best friends and loved ones? Ready to kick back and enjoy the view of the ocean’s blue? At Secrets® Aura Cozumel, we want you to join us for a trip under the sun that you will never forget! Before heading into the weekend, it’s time to check out a few new photos from Secrets Aura and see how you could be spending your time with your best girls and best guys! It’s time for a group getaway to Secrets Aura Cozumel! Our Top 10 Instagram Photos in 2016 from Secrets Resorts & Spas! We have come to the end of another great year and it’s time to extend a huge thanks to all of our guests and fans of Secrets® Resorts & Spas! Thank you for spending your vacations with us! To finish off the year, we’re sharing our top 10 Instagram photos from @SecretsResorts. If you aren’t following us, be sure to do so! Read on and check out these stunning photos! Take a trip down memory lane from @SecretsResorts! Top 5 Reasons to Plan a Romantic Getaway to Jamaica! Happy #BeachThursday to all of our guests and fans of Secrets® Resorts & Spas! For this #BeachThursday, we are excited to put a spotlight on Jamaica and why you should plan a romantic getaway to this island paradise! Secrets St. James Montego Bay and Secrets Wild Orchid Montego Bay are located in Jamaica and offer a great romantic escape for you and your loved one! Read on to find out our top 5 reasons as to why you should plan your next romantic getaway to Jamaica! A romantic getaway is in your future when you visit Jamaica! Is it that time to pop THE question to your special someone? Want to make it extraordinary, but don’t know where to get down on one knee? Secrets® Resorts & Spas has got you covered with the perfect tropical setting to ask and get that “yes” answer! Read on to learn about Secrets Resorts & Spas’ engagement package! Planning a proposal? Let Secrets Resorts & Spas help you ask the most important question of your life! The selling price for this package is $299 USD or complimentary when staying 5 nights in the required room category or higher. Andrew and Chathry had a beautiful engagement at Secrets Silversands Riviera Cancun! Indulge in a romantic dinner at Secrets The Vine Cancun before you pop the question to your special someone! Make your engagement as romantic as possible at Secrets Puerto Los Cabos Golf & Spa Resort! Let us take care of the details as you get ready to pop the question! At Secrets Resorts & Spas, we want this special moment to be one you will remember for the rest of your life! Pop the question in paradise and it’ll be a memory you will have forever! Book your trip to Secrets Resorts & Spas using AMResorts’ 15th Anniversary Promotion going on now! 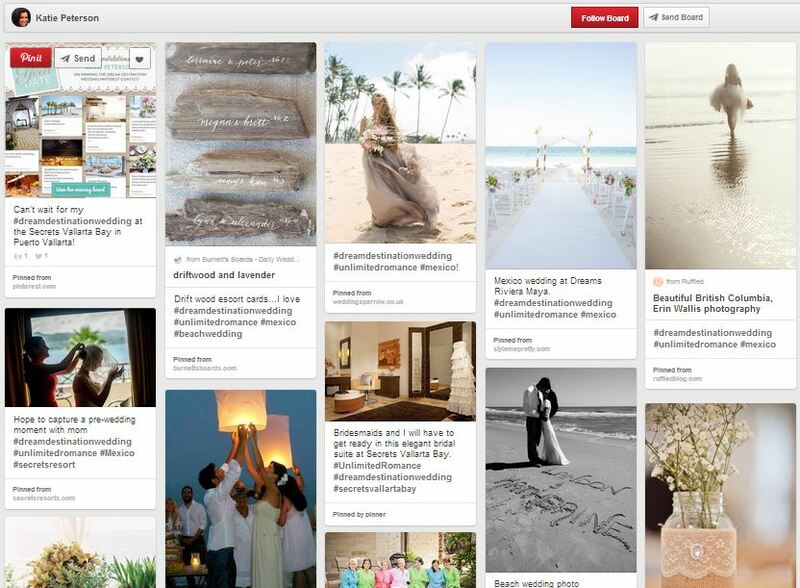 Meet Our Dream Destination Wedding Pinterest Contest Winner! 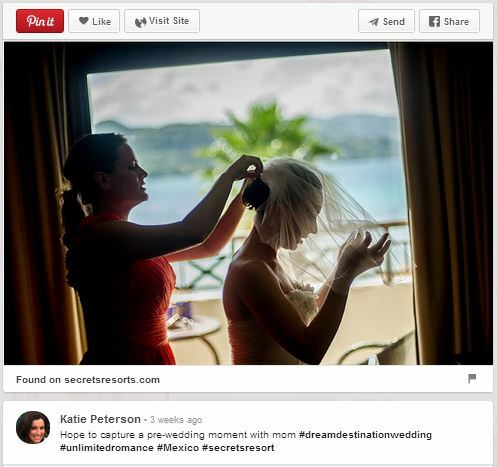 Katie Peterson’s Dream Destination Wedding Pinterest contest board. 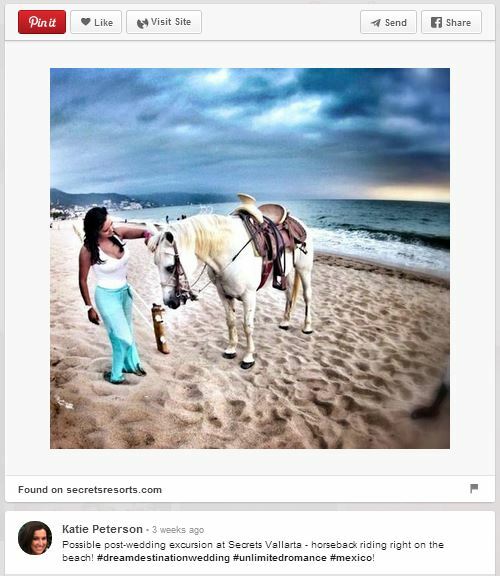 Congratulations to the winner of our Dream Destination Wedding Pinterest Contest, Katie Peterson! Take a look at her incredible Pinterest board and you’ll see why she deserves this fabulous destination wedding at Secrets Vallarta Bay Puerto Vallarta. Katie was chock-full of wedding inspiration and we can’t wait to celebrate her big day with her come November. 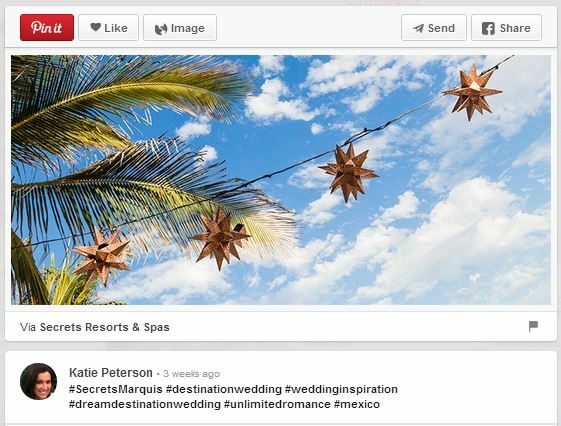 Be sure to follow @SecretsResorts on Pinterest for more stunning wedding photos and your daily dose of beachy beauty!